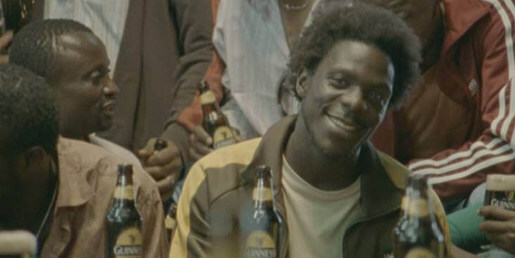 The Guinness connection with football greatness in Africa is celebrated in “Scout”, a television commercial based around the central idea that there is greatness in every man, everywhere and is a call to action for men to step up and realise their potential today. British actor Danny Webb arrives at an African airport as Mr. Tommy Howe, a football scout. Journeying to Africa in search of the Greatness in one player, he eventually finds its presence everywhere. As Howe’s driver shows him through the city, he passes impromptu football matches taking place all around, on the side of the street, in a hotel carpark. Webb’s driver, a spectator at the official match, becomes the unexpected hero, seizing opportunity to demonstrate his own exceptional skill when the ball comes his way on the sideline. ‘Scout’ was released in Nigeria in November 2009 to coincide with the Nigeria versus Kenya World Cup qualifier match in the African Cup of Nations. The spot has since aired in Ghana, Kenya, Cameroon, Uganda and throughout 13 venture markets including Benin, Burkina Faso, Chad, Cote d’Ivoire, Congo Brazzaville, Democratic Republic of Congo, Equatorial Guinea, Gabon, Gambia, Liberia, Mali, Sierra Leone and Togo. The Scout ad was developed at Saatchi & Saatchi South Africa, Cape Town, by executive creative director Anton Crone, creative director Gavin Whitfield, art director Gareth Cohen, agency producer Lee-Anne Jacobz, account team Kyle Marquis and Andy Bell. Filming was shot in Nairobi, Mombassa and Malindi by Greg Gray via Velocity Films with director of photography Paul Gilpin, producers Helena Woodfine. Local production was provided by Mario Zvan, BlueSky Films, Hermal Shah, Paolo Sassi. Editor was Ricky Boyd at Deliverance Post Production. Music was composed by Johnny de Ridder at Softlight City. Sound was designed by Arnold Vermaak at B&S Studios. The footballers featured are all local amateur players from Nigeria and Kenya, put through a four day bootcamp with top football choreographer Mike Delaney. The taxi driver is an Angolan born footballer living in London. He choreographs and stars in football commercials as well as being a freestyle champion.